Over the weekend Peeper reader Imelda Murphy of Nashua, New Hampshire, got in touch to let me know that she had been the high bidder for Queen Victoria's nightgown. "In the scheme of things, Imelda Murphy's $10,000 nightie was a steal. "Without it, her recently penned play, The Quane's Laundry, would just be another work of historical fiction about royal bloomers and the fallen women who washed them one fateful night in turn-of-the-century Ireland. "In the heat of auction, Murphy, of Nashua, broke her budget but scored the lace-trimmed sleepwear, once worn by England's Queen Victoria, for 5,500 sterling -- about $10,800 U.S. dollars. "'It was like I was in a trance,' Murphy said of her winning moment. "She was listening to the auction in Derbyshire, England, by telephone Wednesday morning. She could hear the sound of the competition -- and all the media buzz -- in the background as she relayed the auction action to her husband, Manchester lawyer Frank Murphy, who was within earshot clutching his wallet. "Murphy said she learned of the historic auction items while surfing the Internet a few weeks ago. "A native of Dublin, Ireland, Murphy felt like she already knew Queen Victoria intimately, having researched her life and her historic final trip to Ireland in April 1900. Owning the royal undies would be like icing on the cake -- sort of. "Murphy's play was inspired by a newspaper clipping about the queen's trip to Ireland, during which Victoria's laundry was in fact sent out to be washed at the Magdalene Asylum, an institution designed to reform prostitutes by having them process laundry all day. "'The Quane's Laundry' -- the word 'quane' meant to portray the Irish peasantry pronunciation of 'queen' -- focuses on one woman's story, Nellie Clifton, who after 39 years living at the laundry, finally comes clean about the incident that landed her there: a scandalous affair with the queen's eldest son, Bertie -- eventually to be known as King Edward VII. "In real life, Nellie Clifton, an Irish actress, did indeed have a scandalous affair with the future King of England. The compelling story line involving the queen's laundry was conjured from Murphy's imagination. "Amid the play version of the scandal emerges a story of a poor Irish girl, born during "The Night of the Big Wind" in 1839, orphaned during Ireland's famine, and taken in by the Wrens of the Curragh -- prostitutes who serviced military men. "Innocent Nellie, through a twist of fate, ends up in Bertie's bed and is sent off as punishment to the Magdalenes at age 22, where she spends the rest of her life. "So naturally, Murphy sees winning the nightgown as providence -- luck of the Irish, if you must. "Luck or godsend, Murphy feels she was meant to own the nightgown just as she was meant to write this particular play. "'That's what I told my husband -- it was meant to be. Of course, all day long, after winning the auction, friends were calling to ask if I'd managed to pick him up off the floor yet,' Murphy said of the aftershocks of the pricey peignoir. "Pre-auction estimates for all three royal garments, auctioned by Hansons Auctioneers, were so low Murphy fully expected to bid on and win all three items -- a chemise, a pair of bloomers and the nightgown. "'My husband and I thought, wouldn't that be lovely for my play? My thought was to have the garments in the foyer so when people come out of the theater at intermission they can have a look at her real clothes. I was going to swoop up all three of them, not realizing the rest of the world wanted them, too,' Murphy said. "Murphy said during the six months she spent writing the play she found a unique way to connect with the spirit of the deceased monarch. "'I only dressed in black. Queen Victoria was in mourning for most of her life and I felt better and more comfortable wearing black when I was writing the play in the evening, by candlelight,' Murphy said. "She's already made progress toward her goal of seeing her play produced -- through recent connections made with some Irish actors in New York City, who are coming here next week to read through the play. "She has enjoyed the creative process and is optimistic that her compelling story and juicy dialogue will be enough to propel her play from obscurity to -- who knows, says Murphy -- maybe the big screen." 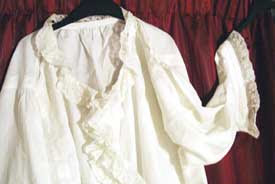 Shown here: The royal nightgown won by Murphy.